Booking travel is a great way for your supporters to raise big donations for your cause. Supporters who book their holidays and travel through easyfundraising raise up to 3 times more for their cause! 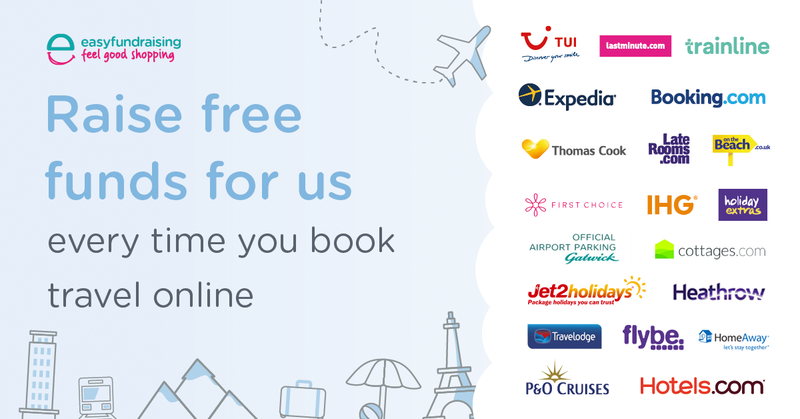 Your supporters can book with all the most trusted holidays companies, such as First Choice, Tui, Expedia, Thomas Cook, Virgin Atlantic, Booking.com, Jet2 and Flybe, and raise big donations each time they travel. Top Tip: Remind your supporters it’s not just holidays, flights and hotels – they can raise donations on car hire, travel insurance, airport parking, foreign currency, and even by buying their holiday wardrobe too! Every supporter could raise over £70 each when they book holidays through easyfundraising. An A4 poster to help you to show your supporters the difference they can make when they book travel. A4 Poster - Word Doc. An A3 poster to help you to show your supporters the difference they can make when they book travel. A3 Poster - Word Doc. A flyer to help you to show your supporters the difference they can make when they book travel. A5 Flyer - Word Doc. Use these handout cards to remind your supporters to raise free funds when they book travel. Handout Cards - Word Doc. Share this post on Facebook to encourage supporters to raise with travel. Share this post on Twitter to encourage supporters to raise with travel. Share this image on your social media pages to encourage supporters to raise with travel. Copy and paste this email text and send to your contacts to help your cause raise even more.